Wounds Underwater - For WOUNDS UNDERWATER: use REEL Body Art Inks for wound, put REEL Thick Blood inside, cover with REEL Original Blood. In water this looks like bleeding and it will last longer. 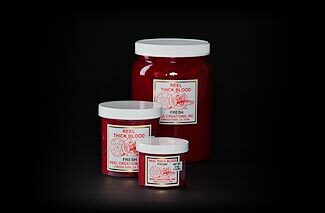 REEL THICK BLOOD is a jam/jell type blood for you the artist to create a 3 demensional effect. The colors speak for themselves. FOR PROFESSIONAL USE ONLY!